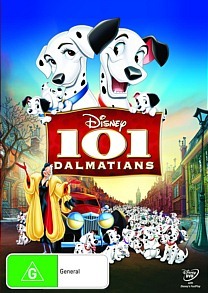 101 Dalmatians DVD Review If you have yet to see 101 Dalmatians or shown it to your children this is the perfect time to get your hands on this classic because as usual the Disney Vault doesn’t stay open for long. As far as animated movies go 101 Dalmatians was always one of favorites and with the new out of the vault release it has never looked better. 101 Dalmatians is the story of how the treacherous Cruella De Vil kidnaps the 15 puppies of Pongo and Perdita and plans to make fur coats from them, thus starting an adventure for Pongo and Perdita to try and save their pups. Along the way the Dalmatians realise that they can’t complete this journey on their own but with the call of the Twilight bark they get the help they need from a huge cast of cats and dogs to chase down Cruella to get back their pups. Disney has yet again released one of their classic animated movies out of the Disney Vault for a very limited time. It’s a two disc package loaded with special features including the newly restored film. 101 Dalmatians is one of the earlier animations from Walt Disney originally hitting the screens way back in 1961 and became an instant classic with kids young and old. When I first saw 101 Dalmatians as a kid I loved it. I remember watching it over and over again, I’m not sure if it was all the dogs, the music, Cruella De Vil or just the whole kit and caboodle but there was no doubt that it never left the VHS player. Having left the VHS behind as I grew older it was the perfect time to get a chance to watch it all over again, and it doesn’t disappoint. The restored version of the film looks incredible; the colours pop from the screen just like it had been made yesterday. The sound has also been restored and nothing was left untouched, upgraded to 5.1 surround, the songs fill your room with melodies of “Cruella De Vil” and “Dalmatian Plantation” with instruments that in previous releases would never had been heard. I did find it interesting how clear the pencil lines have become in this rerelease you can see in some cases through out the film that the artist had left in some of the original pencil lines and the colours go over the lines but by no means does this take away from the movies it just adds to its charm. Packed with special features spanning over 2 discs including deleted scenes, numerous cut songs, trailers, teasers, making of features and a lot of games made for the kids. This features some of the best behind the scenes featurettes I have seen in some time, spanning from how the movie was animated and how real dogs were used to make the animations more life like, to character design and character development there is a lot here to keep you preoccupied for hours and get a more in depth look into the animation world and of course Walt Disney. If you have yet to see 101 Dalmatians or shown it to your children this is the perfect time to get your hands on this classic because as usual the Disney Vault doesn’t stay open for long.